5th Annual “Fit Fathers Day: Celebration: Empowering dads, father figures, families and kids! What another spectacular year honoring Father’s Day with 500 plus family members in Silver Spring, MD. Fit Fathers Day (FFD) is our celebration honoring dads, uplifting fatherhood, strengthening paternal bonds and recognizing the influence of fathers in our society. The Fit Fathers Foundation believes ultimate health, fitness and nutrition can help individuals live longer while challenging everyone to eat clean, stay active and continuously energize their lives! 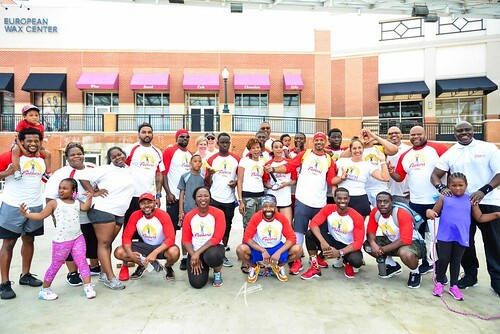 We bring dads and father figures together annually to demonstrate the importance of being health conscious and leading by example through positive, nutritional choices. For the 5th Annual “Fit Fathers Day” Celebration life enhancement manifested once again in the form of festive and energetic activities. Exercise, laughter, dance, music and fun is the “Fit Fathers” way of manifesting joyous occasions in the Maryland, DC and Virginia area. Brought to you by Mazda, Physicians Committee for Responsible Medicine, Chrysler, Mom’s Organic Market, Volkswagen, Toyota, The Washington Auto Show, Gym Source, Road Runner Sports, Striders, ZICO, Soul Cycle, Nissan, Yokohama Tires, Thule, Meatless Monday, Wegmans, Kia, Gold’s Gym, Hip Hop Fathers, Modell’s and Vibram, the Father’s Day celebration provides dads with the tools needed to engage their families toward increased fitness, ultimate wellness and positive, nutritional habits while honoring the true meaning of fatherhood. Hype for the event was built from engaging social media campaigns and coverage from News Channel 8, WUSA 9, CBS Radio, NBC 4, Radio One and a host of other elite media outlets. Additionally, with $2,500 in prizes at stake from Sean John, Modell’s, Yokohama, Vibram, Gym Source, SoulCycle, Live Nation, Striders, JBL, Jabra, Thule, INCREDIBLES 2 and Road Runner Sports by competing in the Mr. Fit Father contest and female plank challenge and our fitness challenges, over 500 attendees came to the celebration ready for action which resulted in an eventful day. Held at Veterans Plaza in Downtown Silver Spring, MD, fun-for-all group exercises with trainers Michelangelo Bance, Tiffani Jenkins and Sofia Rodriguez (Glute Camp) motivated the crowd. The Zumba experience by Z Sweat Dance and Fitness sent the ladies in the crowd into overdrive while yoga was led by Conscious Crusade to the melody of PanLara’s steel drums. The kids highly adored the interactive playground while guests were treated to DJ Blinks who kept everything grooving as he spun hit tunes on the 1s and 2s. Additional entertainment featured a capoeira performance by RODA Movements and a jump rope demo from Greenbelt SITY Stars. In addition, much love and respect is directed to our auto sponsors for assisting in making this event a success. A special Auto Fit car show by Automotive Rhythms featured the flavor of active lifestyle vehicles from Mazda, Chrysler, Toyota, VW, Jaguar, Land Rover, Nissan and Kia! A special thank you to Fit Fathers’ Radio One media partner known on the air as Majic, Praise and WKYS! We honored our 500-plus attendees for supporting the cause with a magnetic workout, prizes, giveaways and life-enhancing materials. Guests left the event already asking about the 6th Annual FFD Celebration in 2019. As well, a very special thank you is in order for all patrons and volunteers who attended and participated. The success of FFD sits with supporters of the movement including Men’s Health Network, WAPA, Capitol Professionals, Roll Call Crew, PAINTS Institute, Lleft Entertainment, Kids After Hours, Powerful Beyond Measure, PanLara, Daddy’s Cool, African American Health Program, Mocha Moms, Montgomery County, Maryland Department of Police, Downtown Silver Spring, Make Smart Cool, Great Kids Events, DMV Social, The Department of Environmental Protection, Vitality Health and Wellness Center and The Fit Solution. FFD was hosted by national ambassador Kyle Arrington who played cornerback for the Baltimore Ravens and has earned a Championship ring with the New England Patriots in Super Bowl XLIX. Off the field he’s a family guy who dedicates success to his wife and kids including the addition of a new baby girl. Although Fit Fathers Day is a special occasion to recognize dads during their time of celebration, our mission also encourages moms, kids and families throughout the year. Stay tuned for more Fit Fathers events as we move forward engaging with various communities around the country. Enjoy the photo gallery.